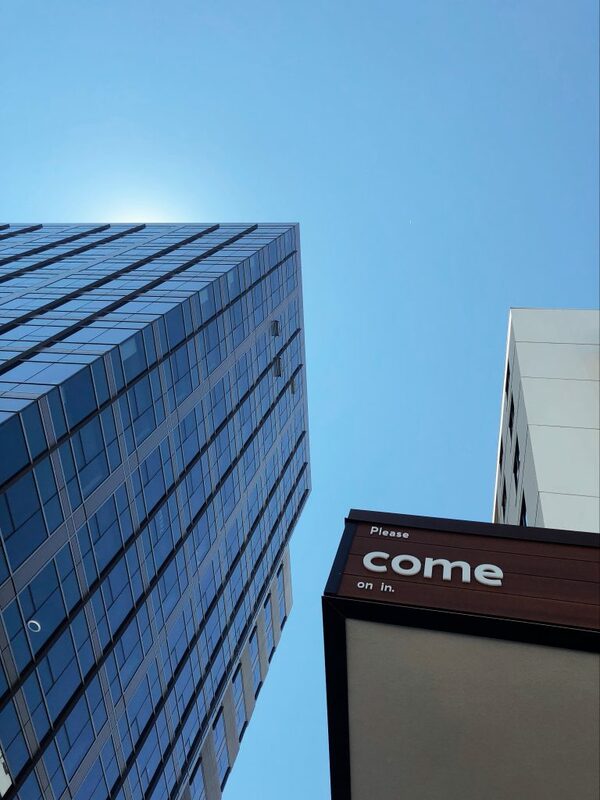 KEEP YOUR GOOD THING GOING WITH EVEN HOTELS! Weekend getaway for one, please and thank you!! This last weekend I wisped (wait, is that a word?) myself away…okay, I just looked it up…it’s whisked! 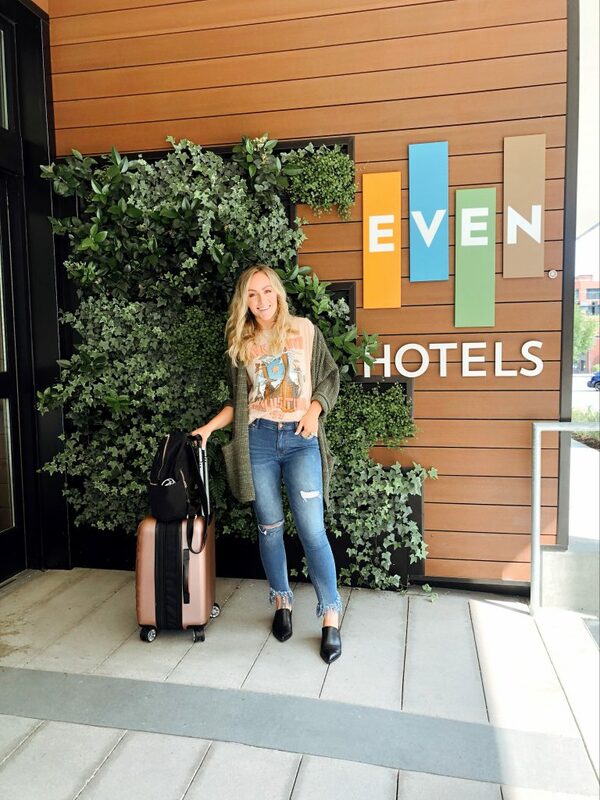 This weekend I whisked myself away to the gorgeous, fun city of Seattle, Washington, for a SOLO… yes, I said SOLO…trip to the new Even Hotels! This hotel really is like no other. Did you notice something different? Holy flippin’ frack, that is a spin bike in my hotel room. Am I at the gym or in my hotel room? Who knows?! I mean, maybe it’s both! It looks that way to me! 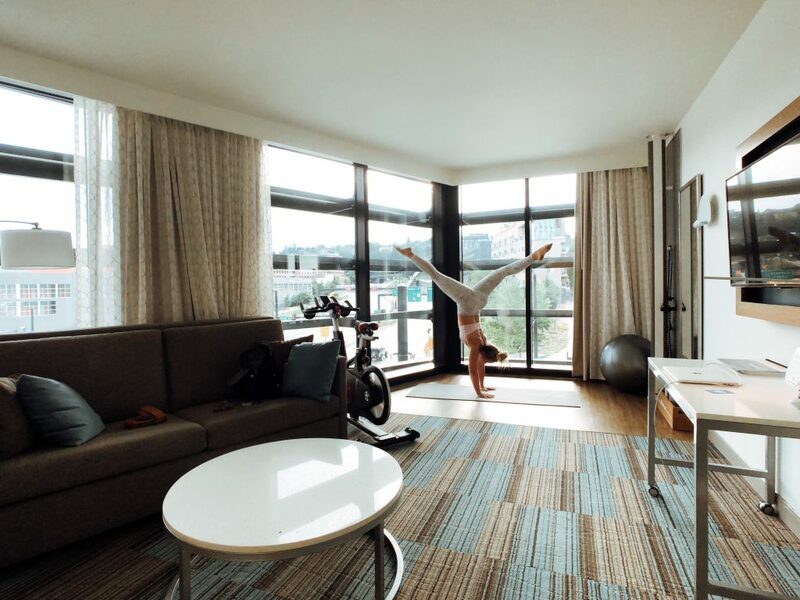 Many other hotels claim to have a decent gym or healthy menu options, but at Even Hotels, their entire focus is on wellness. From the affirmations painted on their walls, to the filtered water on every other floor, and even their fresh and health-focused cafe, all those are just a few examples of how they’ve placed wellness before everything else. And in my opinion, if wellness is first, then everything else falls into place! Many times when I travel, I feel unsafe to go running outside, yet the hotel gym doesn’t have the space or equipment I wish to have. And let’s be real for a second: I do not want to work out in a 10×10-foot place with random strangers and ill-kept equipment. Most of the time, I resort to laying a towel on my hotel room floor, making no excuses, and busting out a workout at the foot of my bed. BUT THIS HOTEL HAS CHANGED ALL OF THAT FOR ME! I was only there for 2 nights but couldn’t help trying out all the equipment and really utilizing the space provided for me. It’s true what they say, “OUTTA SIGHT, OUTTA MIND!” And I often let myself go when I vacation, but that quote is the same when it is reversed! “WHEN IT’S IN VIEW, YOU WANNA ROCK IT!” And rock it, I did! I kept my good thing going and rocked my workouts in my hotel room. I didn’t even turn on the TV EXCEPT to access the prerecorded workout videos you can follow along with in the comfort of your room. They even have a flip chart full of pictures and instructions for warming up, focusing on certain muscle groups, doing cardio, and cooling down. No excuses. No problem. 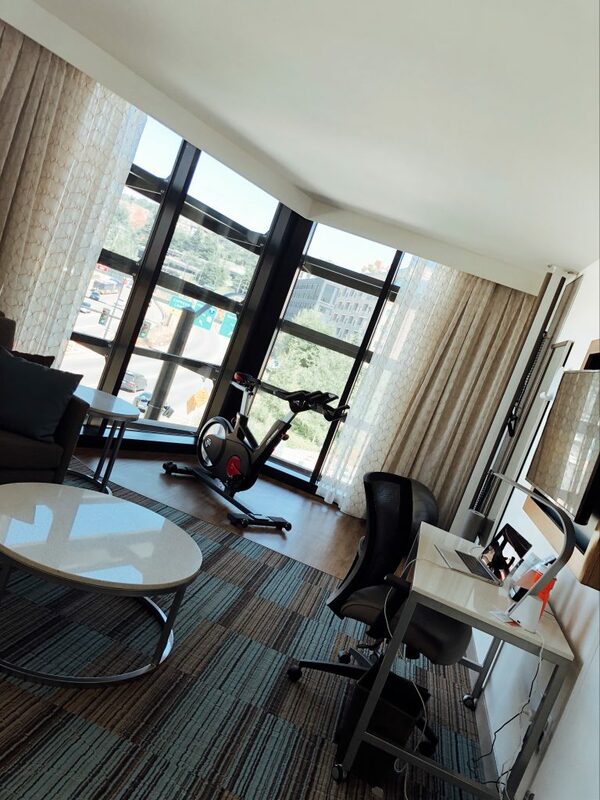 Although this blog post focuses on the hotel room itself, the entire Even Hotels is filled with incredible amenities, including a huge workout facility with top-of-the-line equipment. 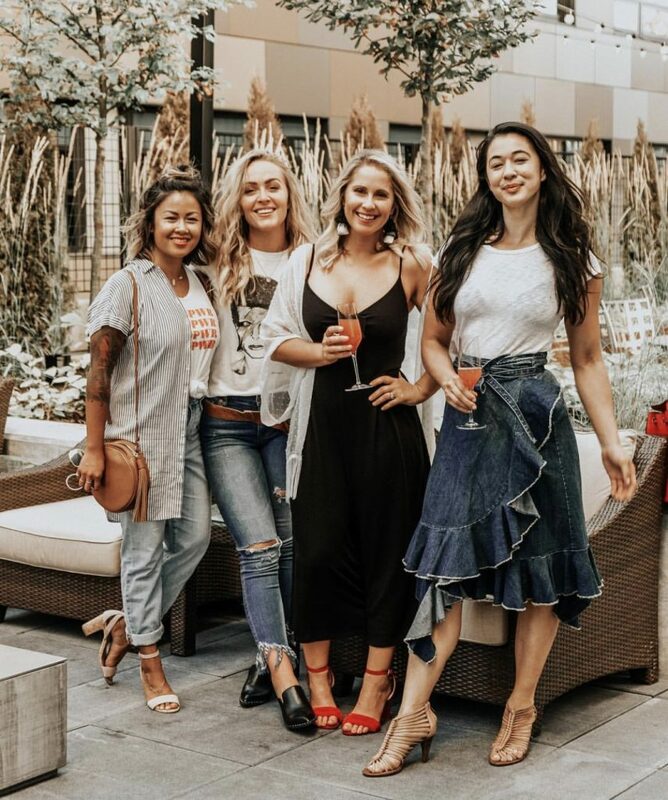 And right outside the gym, you are welcomed to enjoy an incredible courtyard area with a BBQ for all your backyard BBQ dreams, a grassy area for family games or gatherings, comfortable seating around fireplaces, and the most energy and ambiance in the city. 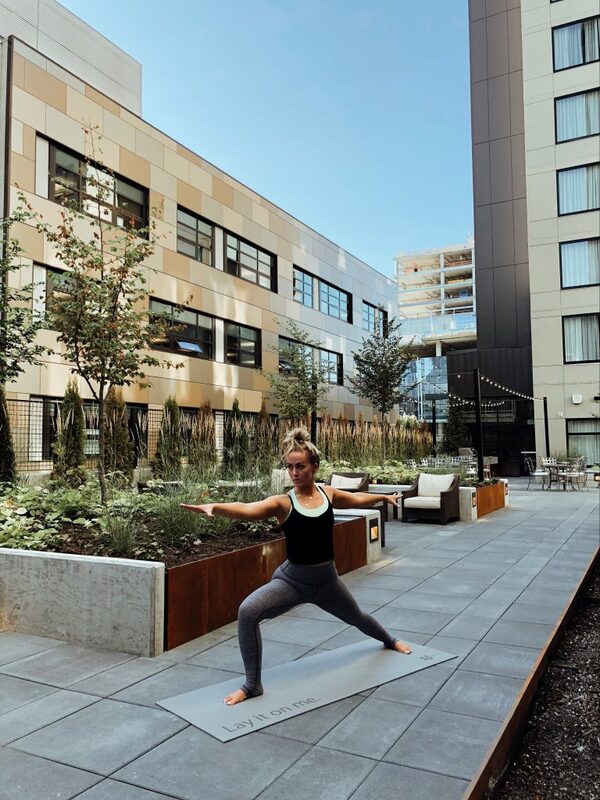 I had the honor of hosting a yoga class in the courtyard to some of my fellow influencers, and the vibe in the courtyard was beautiful and perfect! It was such a special experience for me to lead such powerful women in such a peaceful space in the middle of the city. Last weekend was a weekend I won’t soon forget, not just because of the incredible experience but also because I got to rub shoulders with the IHG hotel employees and had the honor to see what they are all about. It’s an incredible thing to see big corporate companies really thinking about the people. The experience. The health and wellbeing. They get it and I am thrilled I get to share it with all of you! Check out more from my stay on my highlighted Instastories labeled “EVEN HOTELS” and check out my workouts!